Excuses are no longer needed as this Homework Assignment planner is designed to help you and your child stay ahead of all of their school assignments and projects. By investing ten minutes into populating all your due dates in this planner you can save yourself a headache down the road. Planning for a successful semester begins by simply downloading this template. Once you open the file using Microsoft Excel, you will want to save it in an easily accessible place on your computer. Begin by selecting the current year in cell N2, then locate and click on the appropriate month using the tabs on the bottom of the excel workbook. Fill out the Weekly Schedule calendar with the classes you take. 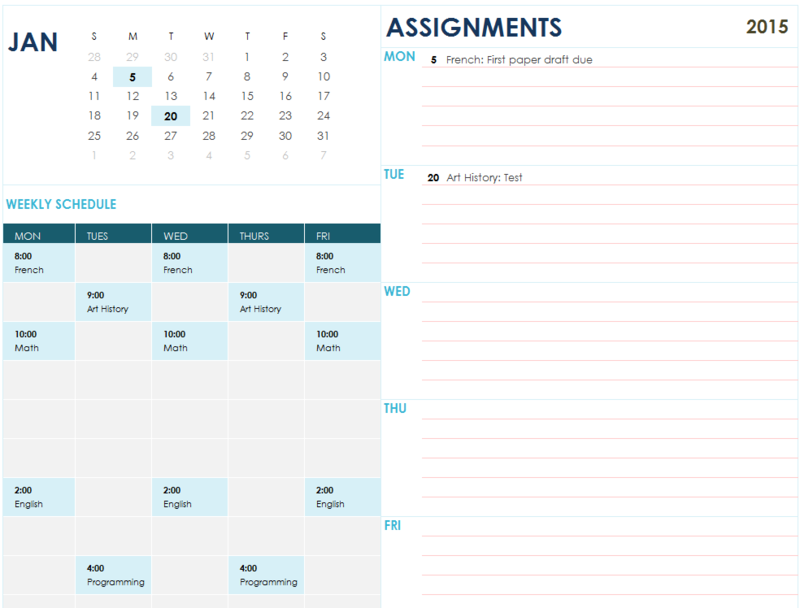 The assignments log on the right corresponds with the monthly calendar located in the corner of the sheet. This useful resource will highlight important due dates for you on the calendar. Select the row of the weekday that your assignment needs to be turned in and type in the due date along with all the details for the assignment. • It is important to remember to save the log each time a new entry is made to it to avoid missing assignments. • It is recommended to check this log daily in order to stay on track of due dates and not fall behind. • Update the planner with new homework assignments and project as soon as you have the information to avoid having to worry about being behind as the due date arises. This planner is a beneficial tool for students, parents and teachers. No matter your role, staying ahead of your schedule and being on time is an important step in having a smooth sailing semester. Students can use this log to remember due dates of various assignments. Parents can gain value from this log by staying on top of their children’s assignments and following up with them in regards to their progress. Teachers can benefit from this template by staying organized on which assignments to collect each day and giving out timely reminders to their students about upcoming due dates. Staying organized is a gift that will help each one of us succeed down the road; it’s never too early to start practicing this habit.